This area where your child can be left alone is vital - but not to protect the child from danger. The goal is to protect your child’s play from you, and to a lesser extent, to protect you from what your child is doing. Our goal is supporting our children’s development by respecting them as the whole people they are and by being mindful of how we create their environment. We seek “Attunement” in this, or any, relationship; being able to imagine the other person’s experience is essential. 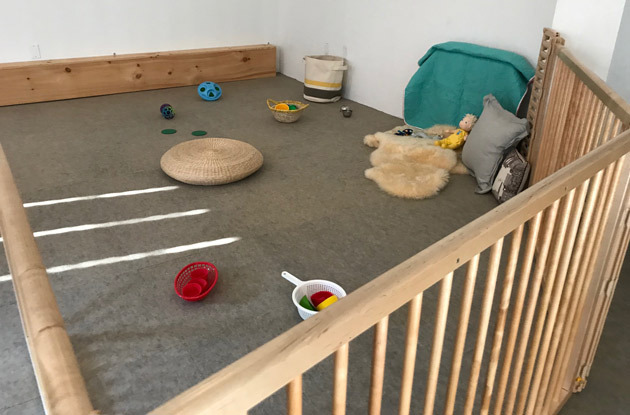 This is handy when thinking through an easy and essential step for the child’s physical environment that many parents balk at: creating a “free space” or a “safe space” (sometimes called a “Yes Space”) in your house for the baby’s use. This does not mean hiring a “baby-proofing” consultant to put pads and locks on everything. It means finding a part of your home, ideally near the kitchen or somewhere else close to where adults work, that is exclusively for the use of the child. It means making that area secure. So, for example, if you were locked out of your house for an hour, and your child was in that space, they’d be fine. (they might need to be changed or be cranky – but they couldn’t get into anything dangerous). This area where your child can be left alone is vital – but not to protect the child from danger. The goal is to protect your child’s play from you, and to a lesser extent, to protect you from what your child is doing. Young children need uninterrupted free play. This means a space where everything can be played with, freely. A place where things can be chewed, pulled, thrown or smacked together. A place for resting or thinking or staring out of the window. A place where adults can visit, and read, or play, but where the child is free to follow their own interests, without interruption. At work in the safe space. Note cardboard box – unbeatable! Your child has a deep need to learn from exploring. If she can reach it, she is pushing, touching, rocking, nudging, or pulling it … experimenting all day long. These investigations need to be followed to their end – the child will stay with the toy/experiment/discovery until they are done, which is exactly when they decide they are done. This is natural, and good, and we don’t want to interrupt it. This is the function of the Free Space. It doesn’t confine the child – it lets him be free to explore on his own. It also allows adults to be free – free to make dinner, free to use the bathroom, free to do email or laundry – the things they need to do – all things better done by adults alone, while, nearby, the child is safely doing their own “work,” rather than being dragged along during the adult’s chores. A child given “free access to adult areas of the house” is going to require constant supervision – which puts a strain on the adults. Worse, as the child explores, her investigations will be constantly interrupted: pulling on the sofa cushion is ok, pulling on the lamp cord is not. Cell phones, door hinges, cleaning supplies, tippy furniture, things adults want to keep organized – these are all toys. How can we ask a two-year old to discern which “toys” are really toys? And what of moving freely? A journey towards the stairs or another room gets the child scooped up – or “managed” – often being told “No” or “Stop” or “Your parent doesn’t like that…” (All things you don’t want to say to a scientist at work). “Uninterrupted Play” is one of our core values, a trusting, positive relationship is another. Parents and kids have more important things to communicate about, and parents have much more to offer, than move-by-move supervision. Parental communication co be better than “No,” “Stop,” and “you can’t have that.” Parental touch is better spent other than prying a newly-discovered-but-not-parent-approved “toy” from a child’s fingers. It is no wonder some exhausted adults turn their child over to a screen. Then, there is the issue of pace. We believe the child has to be allowed to set the pace of their own exploration. 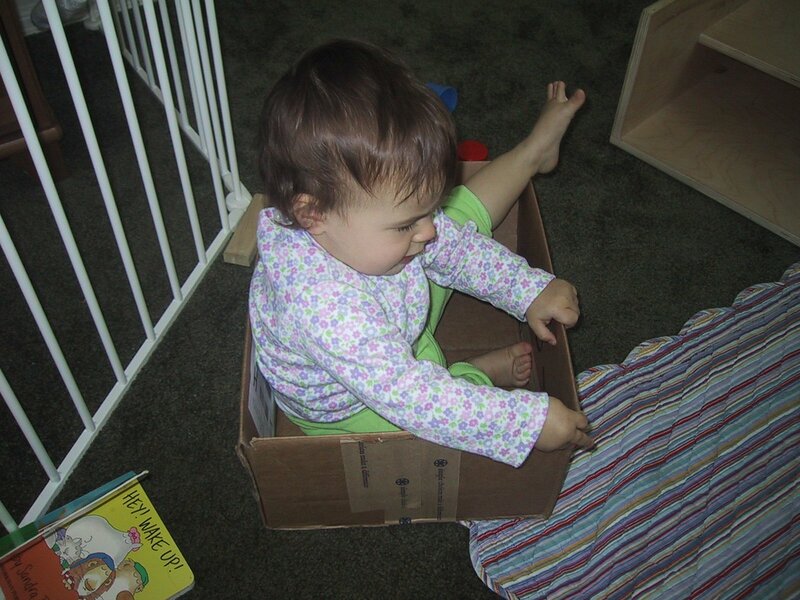 Exploring, learning, physical play – – these things all have a pace to them, which varies, and is set by the child. A child who is “Free to Focus” will stay engaged with something until they’re done – even if they come back to it every day for a week. This “stay with it until I’m done” approach allows completion of thoughts, creativity, and deeper discoveries. It rewards, and nurtures, patience, and persistence. 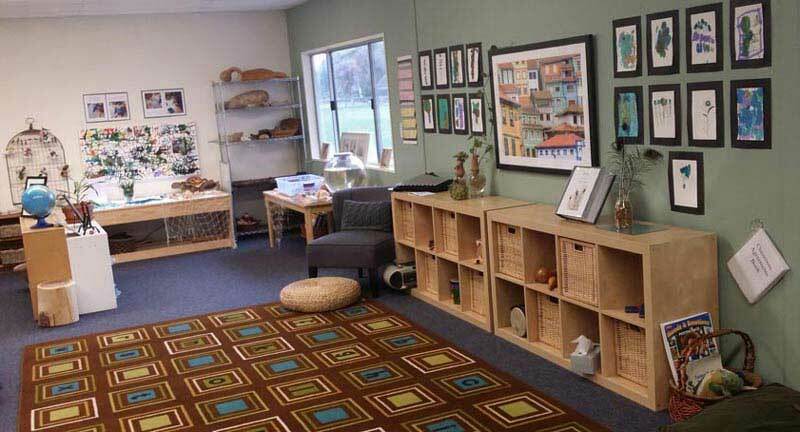 (You’ll see this approach in Reggio Emilia preschools – where children may put their “marker” on one project, and work on it for as many days as they want – multiple weeks on building or art projects are the norm). This focused engagement is possible when the child is in their own space. It’s simply respectful – a place for them to be on their terms, in their world, without interruption. So, take a moment to imagine your child’s experience of exploring. No adults are needed, and constant regulation or even commentary ….. not so good. So, that little prison line thing you’re seeing? It’s not to keep your kid in, it’s to keep our world out – it is a space only for them, and their activities. As is often the case, there is a central powerful idea here, one that you may be applying for one of the first times in your child’s life, but one you’ll come back to as your child gets older. You are supporting a completely separate “Kid World” – an age-appropriate environment; clean and safe enough; but most important a world with the comfort of consistency and the appropriate level of stimulation and challenge. You’ll learn to recognize such “Good kid spaces,” and to seek them. Places where your child is not just “fine,” but is fully challenged and engaged. You’ll see it in playgrounds, friend’s houses, in schools, summer programs, etc. Some parents have trouble with this: they project their fear of loneliness or separation onto their child, or are just uncomfortable with the independence and separation that healthy boundaries support. While they might say “but I don’t want to put my child in a pen – they should be ‘free,’” they aren’t seeing the security that comes from being in a Free Space – a place where you can play and explore freely is true freedom, compared to trying to do your important work in the alien “adult world,” where you are constantly at risk of being interrupted, directed, or corrected.